Last night was a super windy one but we were treated to a beautiful sunset here on the Outer Banks. I had my tripod and pochade box all set up on the deck and just waited for the moment to start. This was painted very quickly between 7:00 and 8:00 PM. I had to hold on to the lid of the box to keep the panel from rattling back and forth due to the heavy winds. I laughed at myself when I came indoors because I could have stood in the bedroom window and painted in comfort. For some reason I felt I had to persevere outdoors. I am really not that much of a purist. Except for picking out some "stuff" the wind plastered in the titanium white I don't plan on retouching this. I would rather preserve the spontaneity warts and all. I used to paint a lot of sunsets but haven't done one in a while and it was fun. They are great for loosening up because all you can do is capture the essence of it and move the paint around intuitively. The light and cloud movement changes much too quickly. Here is my set up. 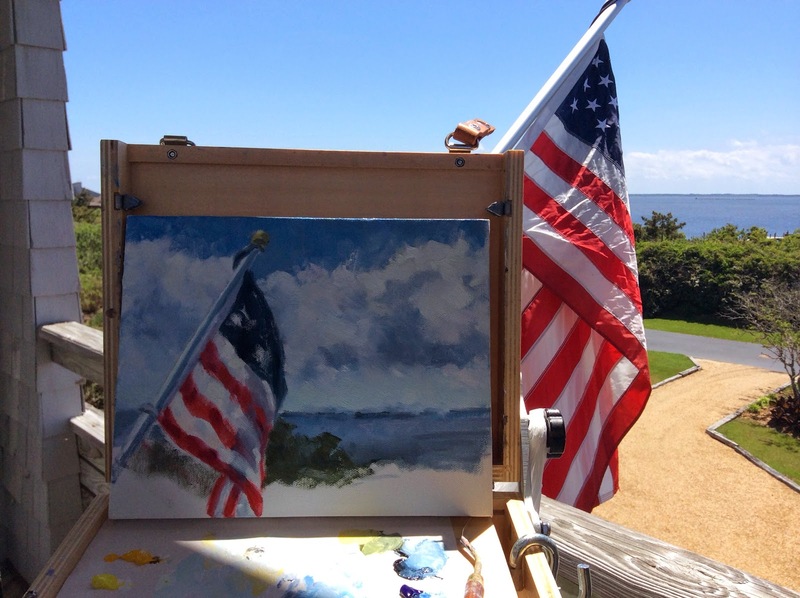 I am a little sorry I didn't paint in the flag as I did in the painting I posted from that spot earlier. Adjusting the red and blue would have been interesting! I had inserted an image of this painting at the end of my last post but apparently Blogger feels two images per post are all I get to be able to work with. 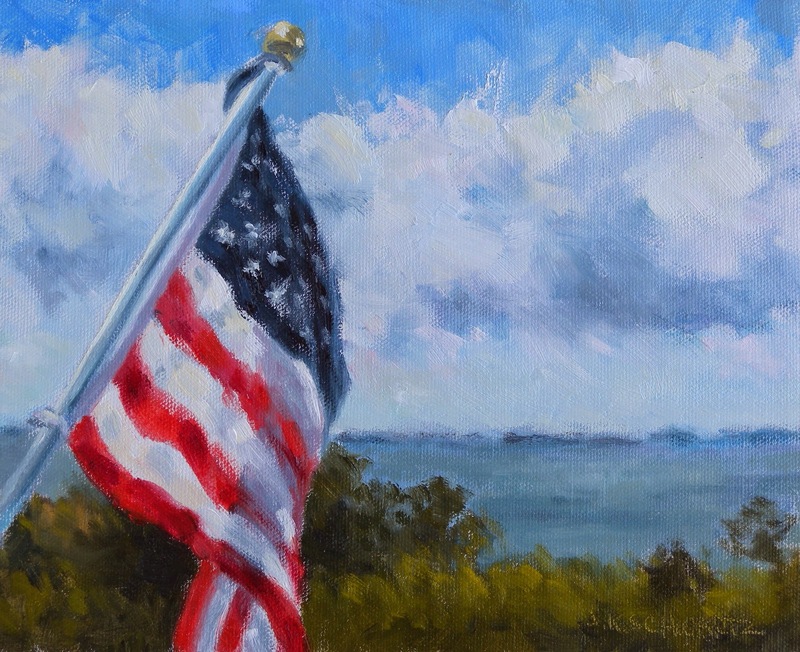 I painted this one standing in the same place (our west facing deck) as I stood to paint my flag painting. 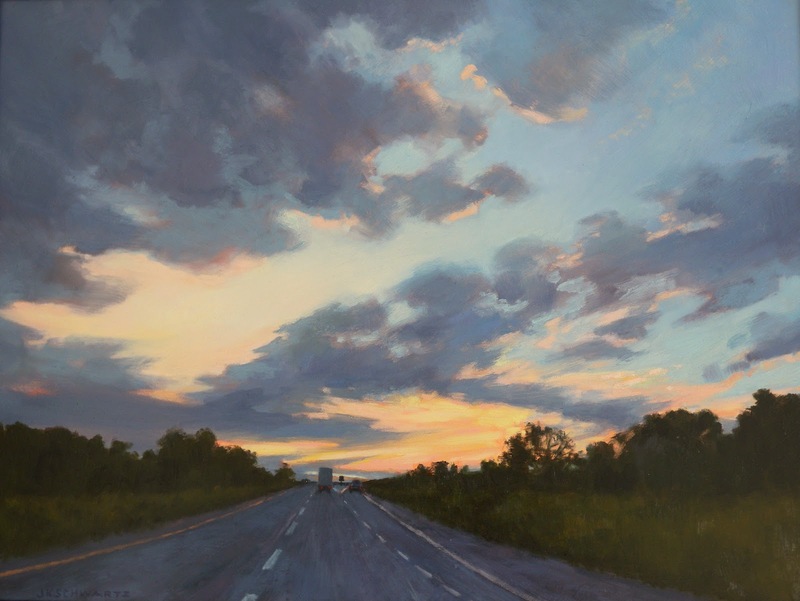 I decided to eliminate the foreground trees so that this painting would be all about the sky and it's reflected color on the Sound. The green would have interrupted all that silver and blue.The clouds were wonderful! Large, shimmery and fast moving. 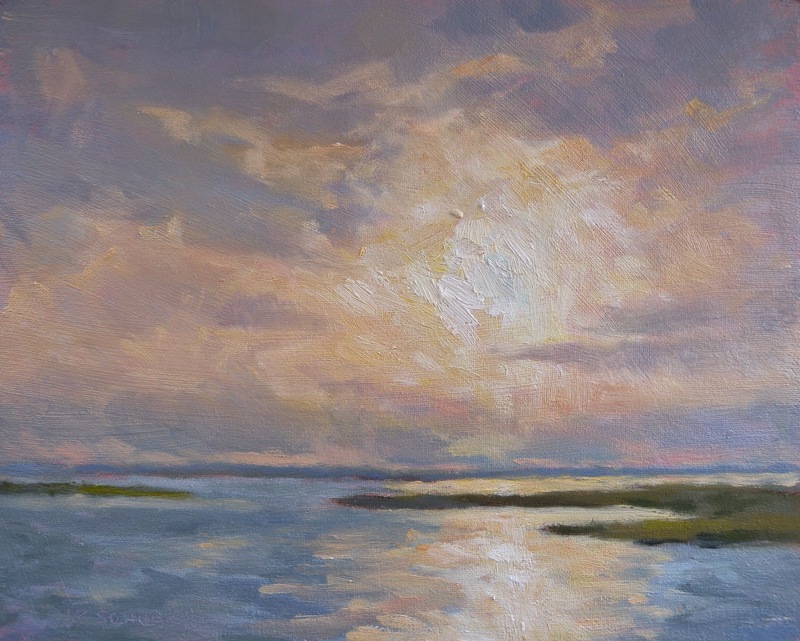 I love watching huge cloud formations moving over a body of water and I find the light and reflections entertaining to paint. The photos from this post are from my iPad as this time the colors were closer to the original than those I took with my camera. It is strange how that happens sometimes. The light here is so intense that I find those from my camera a bit bleached out. If I could upload them on my computer I would be able to make some adjustments with Photo Shop to come closer to the original work. If I were a better photographer this wouldn't be an issue. 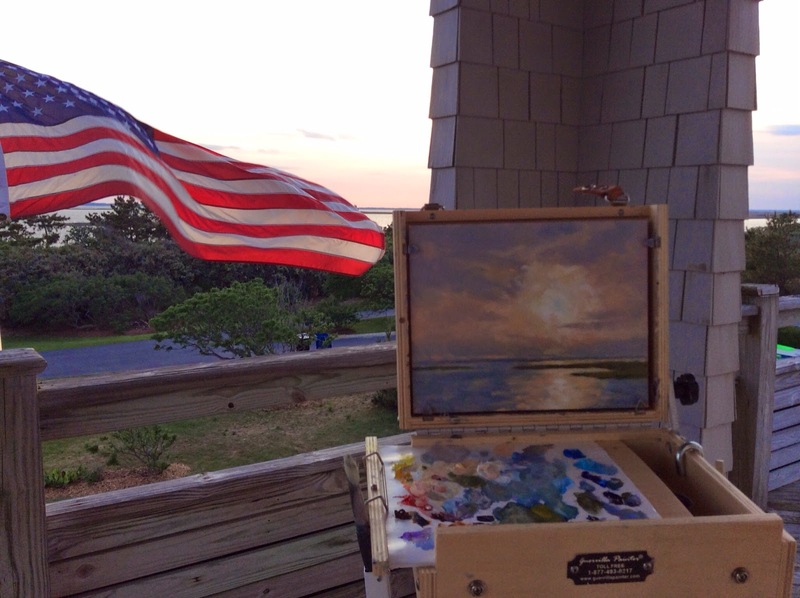 Last evening we had a beautiful sunset and I was able to paint it from that same west facing deck mentioned above. I will post that in my next entry. I have to say the extreme winds made that one more of a challenge than this even with the relative shelter of the house. All in all a lovely Memorial Day and I hope yours was a peaceful one! We're back on the Outer Banks! The weather is spectacular, the ocean is warm and I intend to take maximum advantage of both. 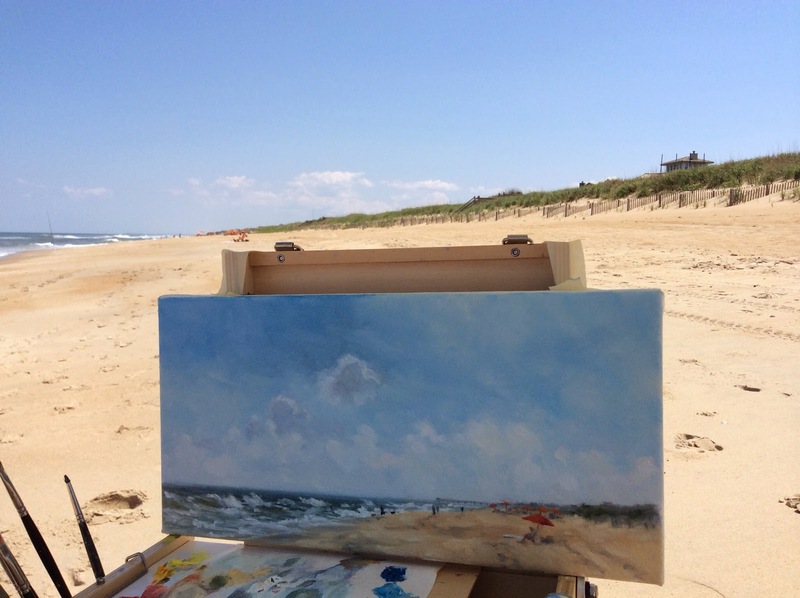 I spent the day painting and chose to focus on the Sound today because dramatic clouds were floating over it as opposed to the cloudless blue over the ocean. It truly is a blue and white world here on the Banks. Lucky for me that it is my favorite color and if you look around my studio you could say it is my signature color. Today, however I had the pleasure of adding the rich red from our flag to the view. It is our tradition on this weekend to place a flag on the oceanside deck as well as the sound side one. Memorial Day weekend signals the beginning of summer and the colorful beach umbrellas dotting the beach will provide inspiration tomorrow. I am working off my iPad down here and don't have any editing apps to help my images so I apologize for the straight from the camera quality which is a little dark. reds and yellows and the top center is for white. My reds today were alizarin and vermilion and my yellows were cad lemon, and cad yellow light. Since I had forgotten to bring ochre I mixed a little of red oxide with the two yellows to come up with a rich, dark yellow. Above is the finished painting that I had showed you while it was in progress. The photo in my last post was taken with my iPad and the red tones were stronger than in the actual painting. This photo was taken with my Nikon and is far more accurate. I find it very difficult to photograph nocturnes. The light has to be just right and the painting angled in such a way that a glare off the dark surface is not picked up. I guess there is as much trial and error involved in photographing these works as there is in painting them. There is a lot of variation in the night sky. I think painting without the light of the moon more difficult than painting moonlight. Clouds help. During a full moon in April I was studying the sky from my bedroom window. There were large cumulus clouds that the moonlight reflected off making the landscape surprisingly bright and there were a lot of cast shadows. It occurred to me that it would be like painting a sunny day painting but with a subdued, lower key palette. So, the next day I tried out that theory using my familiar farmhouse scene which I can paint from memory. It was quite easy. Here is that little painting. Some night skies are inky blue, some ( like in my painting above) have a greenish tint and I find that when in the city the night sky seems more purple in contrast to the city lights. Since I live so near to the city I am also aware of the sometimes rosy and sometimes purplish light that reflects low in the sky and that I can see above the trees when I look toward DC. I added that light in the Kennedy Center painting near the horizon. We will be heading to the Outer Banks this week and I am disappointed that there will not be a full moon. It will be in its last quarter on Wednesday and I don't think there will be enough light cast on the ocean. Maybe next time. LAST WEEK FOR THE MASTERS EXHIBIT www.salmagundi.org. This is a beautiful show in the newly restored main gallery. The Club is at 47 5th Ave. NYC. My painting "Different Paths" is in this show. 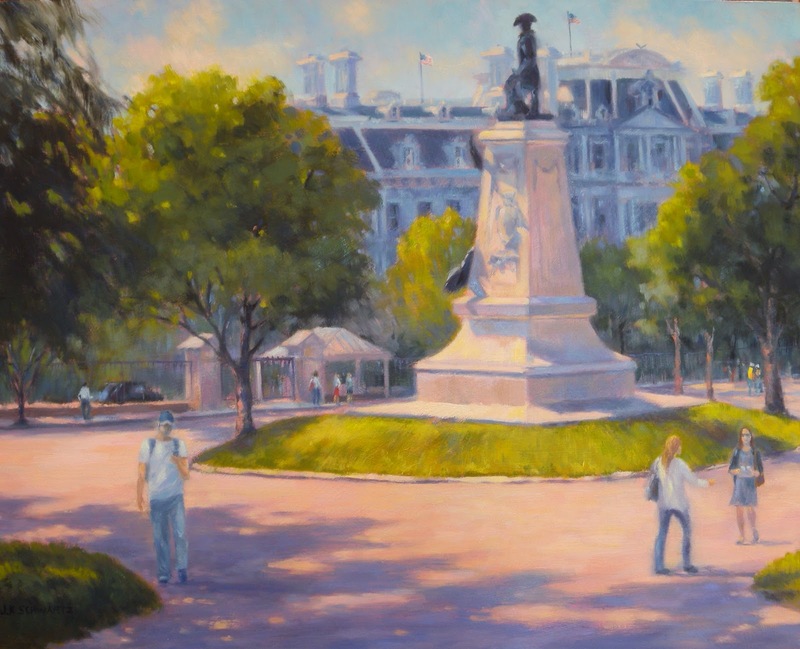 I never posted the finished version of "Lunchtime in Washington Square" that I had been writing about. Actually, it has been finished for a while now but as you can see by the date of my last post I have not been blogging in some time. I also haven't updated my website, nor have I posted in the various artist groups I participate with on Facebook. I have needed to ignore whatever I can to find enough time to paint. I am now ready for the June show at American Paintings Fine Art in DC. Frames just arrived today and I am looking forward to starting that part of the job! checking in as I promise to be posting my efforts in that genre. Here is one I am working on now. In February I posted a photo of my painting in progress along the banks of the Potomac on a very mild winter day. 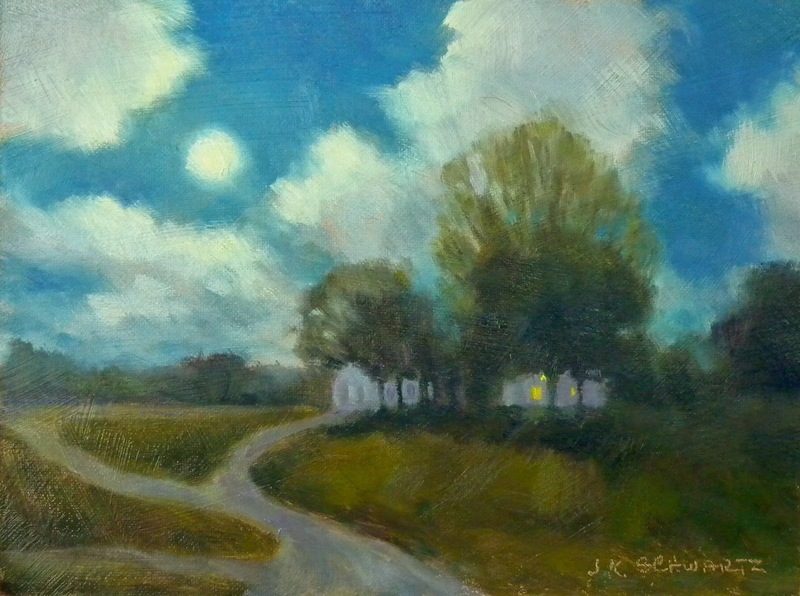 I used that little plein air painting as the study for this 10x20 nocturne of the same view of the Kennedy Center. I need to work on the trees and shrub in the foreground and add the lights to the bridge which will be reflected in the water. It has come along rather quickly and I am already looking forward to the next one!